Some thoughts inspired by the latest event giving hope to many in Nigeria: the emergence of Alhaji Atiku Abubakar as the presidential candidate of the foremost opposition party in the country, the People’s Democratic Party (PDP). Atiku, whose political career has spanned over four decades, served as Vice President under retired general, Chief Olusegun Obasanjo, from 1999 to 2007. 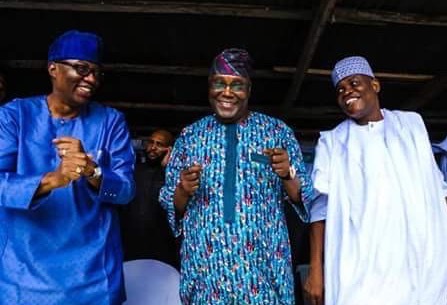 He has contested in five presidential primaries and like an idea whose time has come, his victory at the keenly contested one organised by the PDP last weekend is being seen by some as an act of God. This is because it seemed unlikely that the PDP could organise harmonious primaries, having been plagued by problems of internal democracy in the past. These problems resulted in the exodus from its ranks of many influential members which helped to give the ruling All Progressives Congress (APC) victory in the 2015 presidential elections. Attempts to produce a consensus candidate from its 13, and later 12, presidential aspirants repeatedly failed. Disagreements over the venue for the national convention itself (where the primaries were to be held) led to litigation but at the last minute, the party yielded to pressure from the Rivers State governor, Barrister Nyesom Wike, to host the event in his state capital, Port Harcourt. The convention turned out to be hitch-free and was generally adjudged to be open and transparent. Atiku beat the other aspirants by a wide margin to give Nigerians opposed to the incumbent administration hope that next year’s presidential elections will be a more even contest with President Muhammadu Buhari, because it is believed that Atiku is the only one among those that joined the race who has the pedigree and capability to match and possibly unseat him. I pray that Atiku remains humble and focused in the face of the massive excitement his candidature has ignited, that he runs an exhaustive and issue-based campaign, and that when he does assume office as we hope, he will be fully accountable (bearing in mind his opponents’ constant accusations of corruption against him). Since he has a cosmopolitan outlook and is a successful businessman, I hope that he will have an excellent economic blueprint and will assemble a world class team to do the job of pulling Nigeria from the brink and reversing the enormous econmic losses of the past few years that resulted from crass ignorance, incompetence, nepotism and religious bigotry. Above all, I pray that he remains committed to and actualises his major manifesto over the years, which is to make Nigeria a true federation where the component states have greater control over their own resources and compete with each other in developmental strides, rather than waiting for allocations from an unduly powerful central government. This is widely acknowledged to be the right way to make Nigeria work and have a vibrant economy but successive governments have lacked the political will to execute it. By God’s grace, I will occasionally give my own commentary as events unfold in the run-up to the general elections next year. I pray that God will halt Nigeria’s slide into chaos, destitution and disintegration through the forthcoming elections in Jesus’ name. You can read my other political poems in this blog under the Poems Category. I would love to hear your views on the issues raised in the poem. Are you as optimistic as I am? Do you feel the excitement or do you have a different take on the situation? Do let me know and share this post widely, if you will. You are richly blessed in Jesus’ name. Olo! I just dey try. 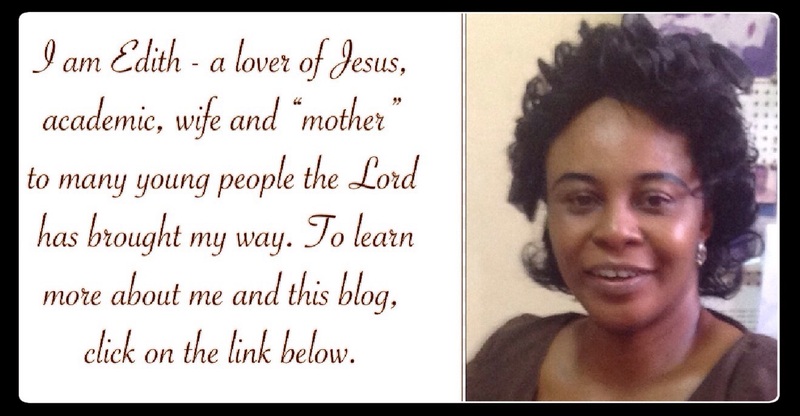 You are highly blessed, Nedu, in Jesus' name. I love this, madam. You see it differently like some of us, the love and hope for Nigeria. Pidgin is also such a beautiful identity. Glad to hear from you, Francis. Let us believe God for restoration and the ability to surpass our previous heights as a nation. Thank you ma, you got it right. If God contnues to be with Nigeria, Atiku seems to be the solution by His grace and all hands should be on deck in prayer to actualise this dream. Yes, Atiku is right for now, to replace the incumbent. May God bring it to pass in Jesus' name. I can't explain how, but I'm optimistic too though it never occurred to me he would win. Nice poem, Ma. Didn't know your pidgin would be so nice!! You're right, I too was concerned about his winning the candidacy. Let's pray that God completes what he has started come 2019. Amen. God bless you too, Elizabeth! Aunty can do well as an indigenous rapper😁. Nice piece. Just hope u we do Atikulate and Nigeria gets better than before. I hope so too. You're richly blessed in Jesus' name. I also pray that Nigeria will experience a positive turn around in all sectors of the economy under Atiku and Obi's regime If they finally win the upcoming election. I still dream of a better Nigeria! Me too! I just can't wait for positive things to begin to happen. God bless you! Yes, my dear! God is in control and He is faithful. He will answer our constant and earnest prayers for Nigeria. great control and use of the pidgin language, it's refreshing to see something new and enticing. Keep it up madam. Thank you, Wisdom! Glad you found the poem fresh. Journey mercies as you travel later this month in Jesus' name. I love this poem, I love the pidgin flavour used to spice it up, I love the creativity behind its origination. I just hope Nigeria would be great again. Me too! I live and breathe that hope. Have a lovely weekend, Blessing! Ma, indeed you are an all-rounder. You really killed it with the pidgin. In my own opinion, ma, l think we should look outside the box 'cause since I became conscious of Nigerian politics, I found out that we are being ruled by the same set of people. I think we should look at other aspirants and scrutinize their capabilities. Thank you. 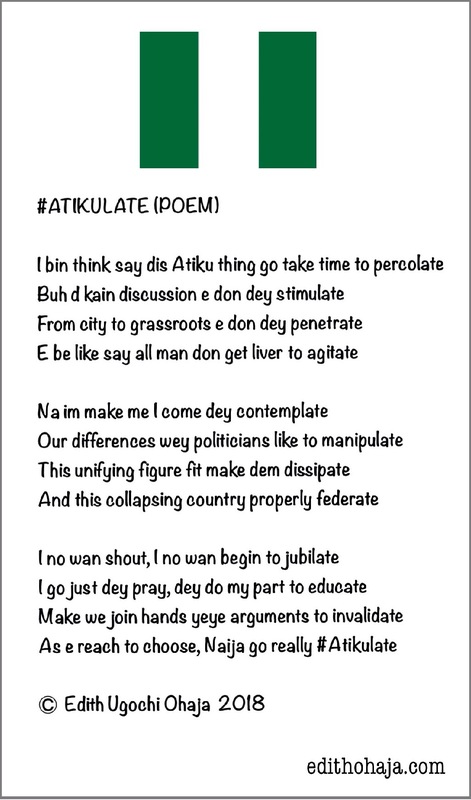 Nice rhyming How sure are we that Atikulating is going to lead to jubilating? This poem is superb! Ma, you really showcased you poetic acumen in this piece. The rhyming of the poem boosted my optimism and my hope for this country, Nigeria; because I am sure it symbolizes that every thing in this country as from next regime, through Jesus Christ who strengthens us, must surely rhyme for the good of this GREAT NATION. More power to your elbow! Am trusting God that a better Nigeria and a better government will emerge from Atiku as he continues to be humble even after election. Seriously I don't like that Atiku man, but if he is the best man to make Nigeria better again, then he can count on my vote. Atiku is not a bad choice though, but I hope his own leadership would make a difference. I like that this poem was in pidgin.Tried my best reading it too.. Lol. I usually get this mixed feelings about Atiku. The same hype most Nigerians are having about him can be likened to that we had about Buhari. All i pray for is the best and if he will give is that. So be it. Very nice poem D ryhmes are wow!! I pray for a better Nigeria free from corruption!! I really wished he was given a chance to rule Nigeria, it's a shame the country won't be articulated anytime soon. You never know. Let's see how the court case goes. And we should keep praying for peace in the country. It's unfortunate, he wasn't given the chance. Nevertheless, I am still very much Atikulated!! I choose atiku over buhari not because his the best but because power really needs to change hand. And to think that Peter obi(an Igbo blood) is to be the vice made me atikulate the more. A really captivating poem, the flow is wonderful and the rhythm is 'wow'. Then down to the content, we were hopeful on the #aticulate ideology but at the end, we believe that God knows better. Nigerians were very eager to articulate. The term articulation was everywhere as opposed to buharism. However, things didn't work out as we thought. We can only hope and pray. Wow!wow!wow! I can't believe say u sabi speak pidge 😂 And the rythem are so beautiful. The fact that Atiku didn't win the election is not making me loose hope. I believe that the next election will be free n fair. So you sabi street language? Lovely. This poem is bae the use of language is captivating. Atiku - Atikulate. We all saw how things turned out. Too bad people that should defend us, manipulate us.